NOTE: This is a sponsored post by Minted. All reviews and opinions expressed in this post are based on my personal view. Thank you Minted, for sponsoring Laura Kyttanen and our nursery journey. I just hit my third trimester and what they say about nesting is true. I found myself getting extremely anxious the other day thinking about all the things we still need to do in order to prepare for the arrival of our little girl. On top of it all, I feel so much guilt because I am way more behind than I was with our first, Aiden. As I was experiencing this overwhelm and guilt, I realized it was time to shut it all off and immediately went to my meditation corner, took a deep breath, sat in silence for several minutes and asked the universe to help me surrender. If you are like me, letting go and allowing things to take its course is not easy. In fact, like me, you probably contribute a lot of your success to your relentless drive and “make things happen” attitude. But you know what I realized during those few moments of silence? All anyone really needs as they enter this world and learn to live here, is love. 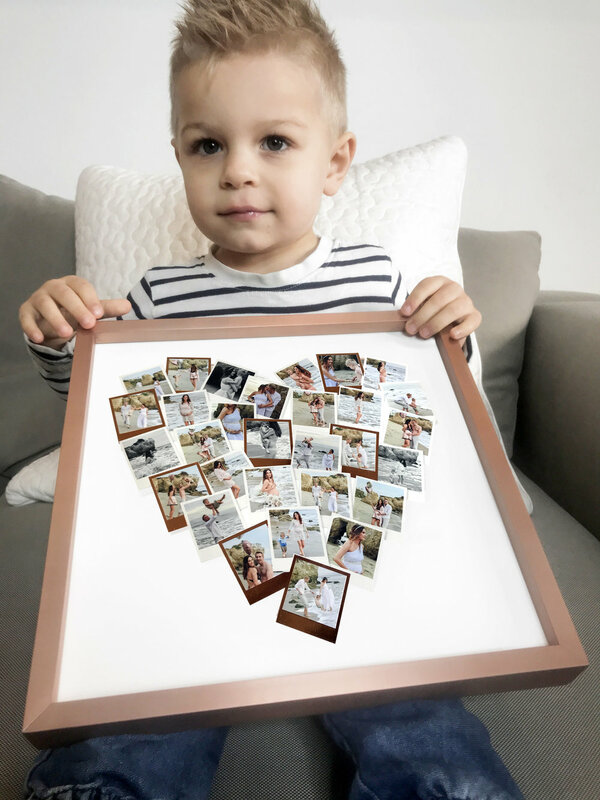 Aiden fell in love with our MInted Heart Snapshot Mix™ photo art print - and of course, he loved pointing to mommy, daddy and Aiden. I decided to focus on the one thing I could create which would add more personalized love to our soon to be nursery and was excited when I found the perfect solution. I have always been a fan of capturing memories and creating art from the major moments in our lives so we can hold onto them forever. If you were to visit our home, you would find photos on the walls from events such as our wedding, my first pregnancy, newborn photos of Aiden, a fall family photo shoot and more. I not only believe it is what makes a house a home but can also help contribute to the warmth and love within a home. One of my favorite places to find and create unique beautiful photo art is Minted. I am especially drawn to this company because of their mission to empower independent artists by giving them a platform to learn, gain exposure and build their business. 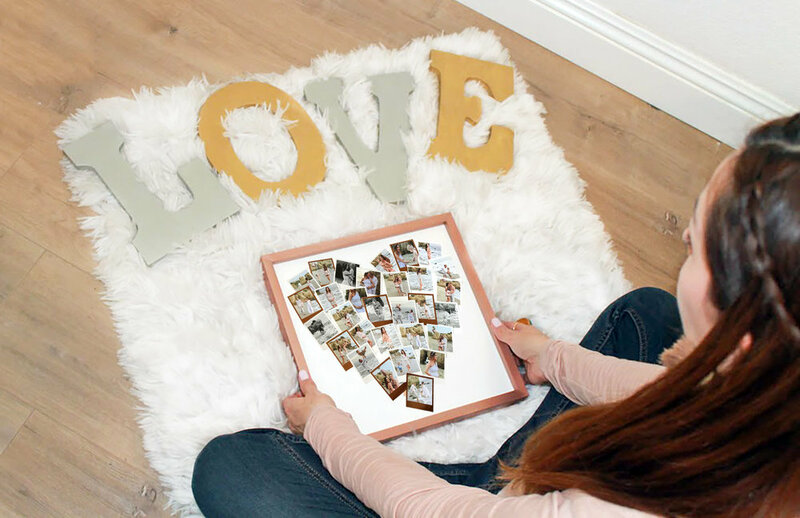 It only seemed fitting that the piece I fell in love with was the Heart Snapshot Mix™ photo art print. I was able to personalize it with 30 of my favorite photos from our recent maternity photo shoot in Malibu. The beginning of our nursery corner started with a personalized photo art from MInted. If you read my blog post Miracle Rainbow Baby Gender Reveal. Surprise, it’s a…, you would learn that this photo shoot was so important to me, not only to capture the joy and love of having family, but the strength of women and the process it takes of surrendering ourselves to higher powers. I am thrilled that, in collaboration with Minted, I was able to create such a magical piece of art to display the joy and love we feel as we welcome this rainbow baby girl into our family and home. And as far as the nursery is concerned, stay tuned! Soon I will be sharing how we decided to maximize the space in our master bedroom to make room for our baby girl. If you already guessed that it will involve rose gold and lots of love - you are right! Thanks for being here and following my journey through all the tastes that life has to offer. Before you continue your day, if you could be so kind as to leave a comment below it would mean a lot to me. I would be curious to know how you add love to your home. P.S. A special note of thanks to our photographer for our maternity shoot - Brenda Marie Winburn. Without her talent to capture these moments, we would not have such beautiful wall art to welcome our little baby girl. If you live in Southern California and are looking for a photographer, I highly recommend her services.